Approximately 75 employees and guests of the Delaware County Courthouse and Government Center participated in an emergency Medical Counter Measures (MCM) training exercise on April 11. The Medical Counter Measures (MCM)/Strategic National Stockpile (SNS) is the United States’ national repository of vaccines, antibiotics and other types of medications, medical equipment, and supplies that may be needed in the event of a public health emergency such as a terrorist attack, flu outbreak, or natural disaster. Once Federal, Commonwealth and County authorities determine that a MCM activation is needed, medicines and/or supplies and equipment would be delivered to the affected counties for distribution to the general population by local public health authorities within 48 hours. Delaware County held its annual MCM Dispensing Exercise to ensure continuity of County government operations in the event of a public health emergency in Delaware County. 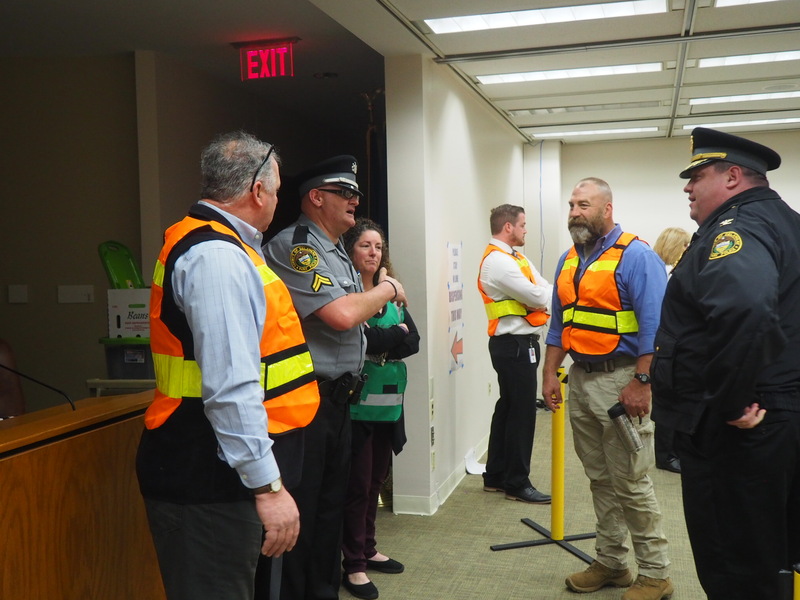 After a presentation overview of the County plan from Wilbur Wolf, Aquila Strategies, a Point of Dispensing (POD) was set up in the public meeting room of the Government Center and employees participated in a mock drill. In the event of an actual emergency, PODs would be set up throughout the county to administer medication, vaccinations or supplies to all County residents who may have been affected.